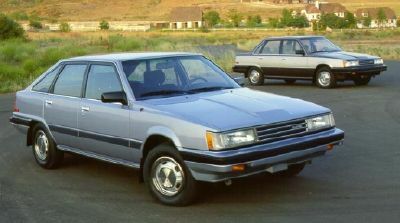 Bowing as a mid-year model, the 1983 Toyota Camry replaced the venerable Corona. Only the liftback was available in Canada. Domestic passenger car sales rebounded in 1983, accounting for 74 percent of sales across Canada. The pattern was different in every region of the country. In British Columbia imports captured 41.4 percent of all new cars. This figure was significantly higher than the rest of the nation but somewhat to be expected since most Japanese vehicles arrived in the country at the Port of Vancouver. Quebeckers were second in putting down their money for cars built in other countries, with 32.1 percent of import purchases. In Ontario, imports accounted for only 20.6 percent of sales. In Saskatchewan the figure dropped to a mere 15.3 percent of sales as imports. Nova Scotia led Atlantic Canada as 20.1 percent of Bluenosers found favour with non-North American type passenger cars. 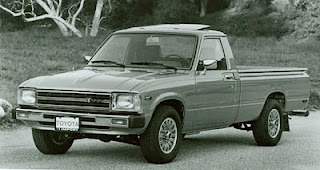 Toyota trucks were the most popular imported haulers with Canadians in 1983. Acutely aware of calls from the Canadian Auto Workers for higher local content and intense lobbying by the CAW for Ottawa to change the rules for the 1985 season, Toyota Canada Limited announced a commitment to build an aluminum wheel plant in a Vancouver suburb. Other Japanese manufacturers promptly pledged $200 million in investments to protect their images in Canada. Toyota’s advertising campaign was clever and unforgettable. “Ooooh! Toyota! What a feeling!” was a one-line jingle fun to sing and a cinch to remember. The company offered a wide range of cars in 1983 from the prestigious and luxurious Cressida, the smaller Corolla, Corona, the teeny Tercel and the tiny Starlet mini car as well as the sporty Celica and the Supra. The company also offered a line of trucks. In fact, Toyota’s trucks were the import industry’s leader in Canada. Toyota retired the venerable rear-wheel drive Corona when the Camry bowed. Measuring 102.4 inches at the wheelbase and 175.6 inches in overall length, the Camry was available only as a five-passenger, four-door liftback sedan in Canada and Australia, though a four-door sedan was offered in other markets. 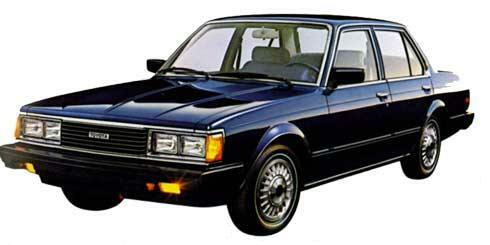 First seen on the 1951 Nash, the rear window wiper was a nice touch on the 1983 Toyota Camry. The $11,378 Canadian version got one a smooth-shifting five-speed standard transmission while $12,118 got one a Camry with the “thinking” automatic transmission. Advertising wasn’t shy to call the car “a whole new dimension in family-car design from the world’s mot successful builder of economy cars,” one having “advanced innovative design and engineering.” Stealing a page from Pontiac, publicity announced the Camry as having “wide-stance stability” with the addition of four-wheel independent suspension. As befitted the times, function followed form to an extreme. The unit-bodied envelope of the Camry was crisp and clean in style, with nary a curve to be seen etched into the sheet metal. The liftback was angular and taut, making it the epitome of every “econo-box” ever built. 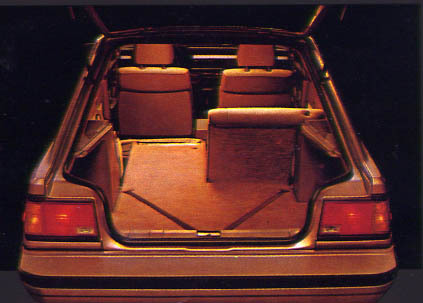 The rear hatch opened wide for 20.1 cubic feet of cargo space but with the seat backs folded flat that more than doubled to 41.3 cubic feet of carpeted cargo area. Split rear seats made loading cargo easier than ever through the Toyota Camry’s enormous rear hatch. Toyota boasted 16,000 kilometres (10,000 miles)—the longest in the industry—between oil changes. The Camry carried on-board microcomputers programmed to alert the driver to any unusual operating conditions. Rack-and-pinion steering, McPherson strut suspension, and power-assisted front disc brakes were part of the value-laden base package. The 2-litre SOHC engine was electronically fuel-injected for highly efficient mileage. It promised 92 horsepower of “pulling power.” A diesel engine was optional equipment in some countries but that was not seen in Canada or in Australia. 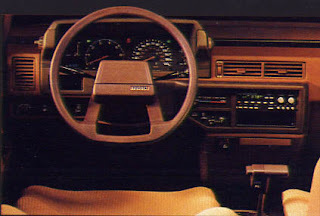 Instrument panel of the 1983 Toyota Camry was as functional and as no-nonsense as a stop sign. The applications of front-wheel drive and a transversely-mounted engine gave the cabin scads of room not found in other cars of its size. “Camry is human-engineered for maximum interior room and comfort. There is comfortable seating for five adults,” gushed advertising about the car. “Camry is Toyota’s roomiest sedan—with the leg-crossing, arm-stretching, hip-shifting room for a family of five.” Carpeting was plush; seats were wide and deeply cushioned before being finished in a “soft patterned” cloth. Those touches helped to take away from the stark, almost Spartan angularity of the design. Exterior colours for Camry were White, Crème, Gloss Black, Silver, Red, Beige, Deep maroon, Light Blue and if solid hues didn’t float one’s boat, Camry could also be had in a pair of attractive two-tone colour schemes as well. Optional equipment was as carefully chosen as a wedding dress. Extra-cost goodies included stylish aluminum alloy wheels, dual-stage air conditioning, power assist steering, and an AM/FM/MPX radio tuner with cassette and a graphic equalizer. The Power Package included automatic power windows, door locks, power antenna, cruise control, and more. A centre console with a special rack to hold cassette tapes was available at extra cost. The power sunroof with the map light got more than a few orders. Despite the addition of the Camry to the showroom floors, Toyota Canada recorded an off year. Sales for the 1983 calendar year added up to 51,282 units, slipping well below the 53,429 units delivered in 1982. Officials couldn’t know it but the company would slide further down the road for the 1984 selling season.